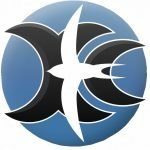 The de-facto website is at XCSoar.org where you find a host of information, including the full/downloadable 200 page manual, the software downloads and much other stuff. An instrument supplied by Get High Stay High will have a good/generic configuration that gives a screen looking like below, with a ‘swipe’ rightwards revealing a full map (no info boxes) and a further swipe revealing an airspace cross section view. For help with either of the above at zero cost (with a short user guide to get acqainted in minutes) just use the email on the CHOOSE/BUY tab. You first need to obtain a new map, airspace or waypoint file and have them available on your computer. Some good sources are covered in the sections 3, 4 & 5 below. To upload a file, simply drag/drop the file you want to upload into any location under the directory XCSoarData. To make file management easier, it is recommended you create separate sub-directories (e.g. 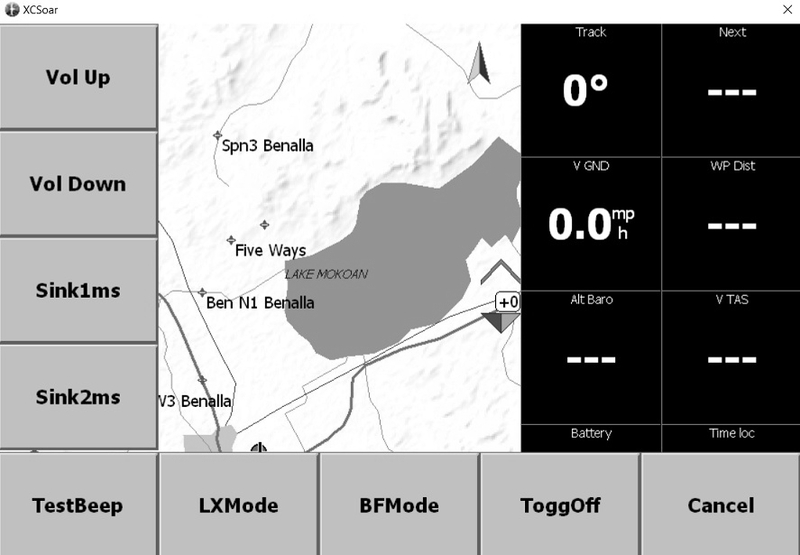 x.Maps, y.Airspace, and z.Waypoints) as annotated in the screen shot above. The IGC log files (created automatically each flight) will be stored in the LOGS directory. To use one, simply copy/save any IGC file to your computer. You can use Tom Payne’s browser based tool XCPlanner to draw a trace of your flight; just drag/drop your IGC anywhere onto the map. The map generator screen looks like below (you also have to specify map name, and level of detail you required). The example orange box drawn over Portugal was drawn with the mouse, and indicates the bounds of the map to be created when Generate is pressed. Try to make maps no larger than (say) the UK or France, as countries of this size will generate a reasonably large file size of around 70Mb, i.e. trying to map the whole of the Europe continent probably won’t work! 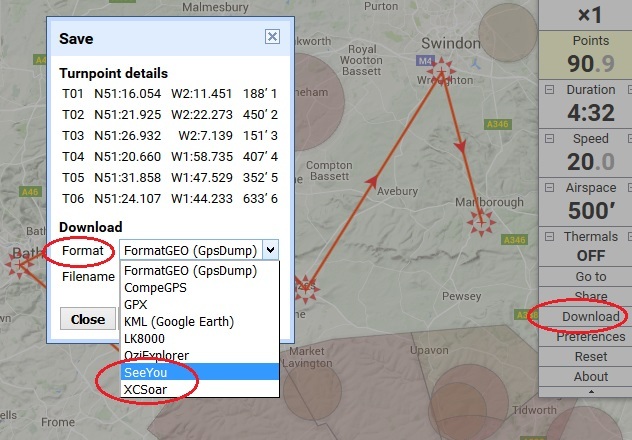 Whilst Waypoints can be created manually using XCsoar, it is far easier to create a selection of waypoints on your computer, save them to a file, and then transfer the file to XCSoar. 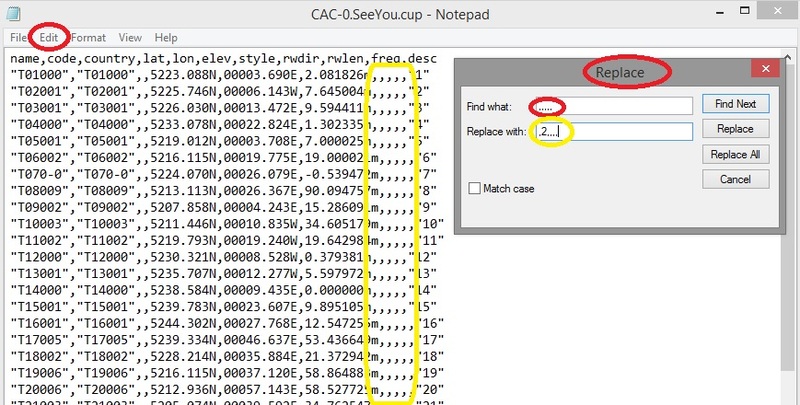 XCSoar can handle many waypoint formats; the .cup (seeyou) format is very popular and will be used here. Tom Payne’s browser based tool XCPlanner is an excellent tool for creating waypoints. Once started in your browser (click the link above) a map is presented and two default waypoints displayed (as red ‘star’ shapes). Further waypoints can be added using a right hand click, and waypoints can be repositioned using the left hand mouse control. In the example above, 6 waypoints were created, and clicking Download in the right hand menu opened up the Save dialogue box. If later you want to edit the waypoint file (e.g. to modify the rather mundane waypoint names T01, T02, etc to something more readable) then the Seeyou format (.cup) is probably the best format to choose. Below is an example .Cup file being edited in Notepad (Notepad is a text editor that comes free with Windows). The Name and Style parameters are the 1st and 6th, annotated as below. For example, you could change the waypoint Name T01006 to Westbury, which is far more user friendly. Changing the waypoint Style (currently null) to 2 will make XCSoar display that waypoint as a 4mm circular blob instead of a near invisible ‘cross’. 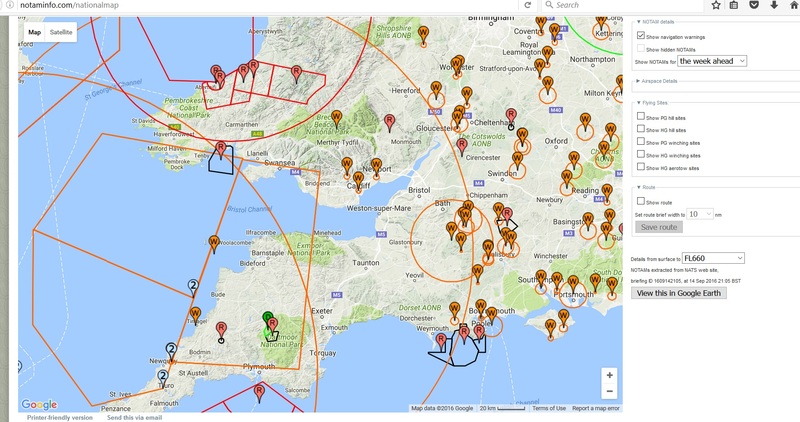 The most useful resource for airspace files for many popular worldwide locations is Soaringweb.org. 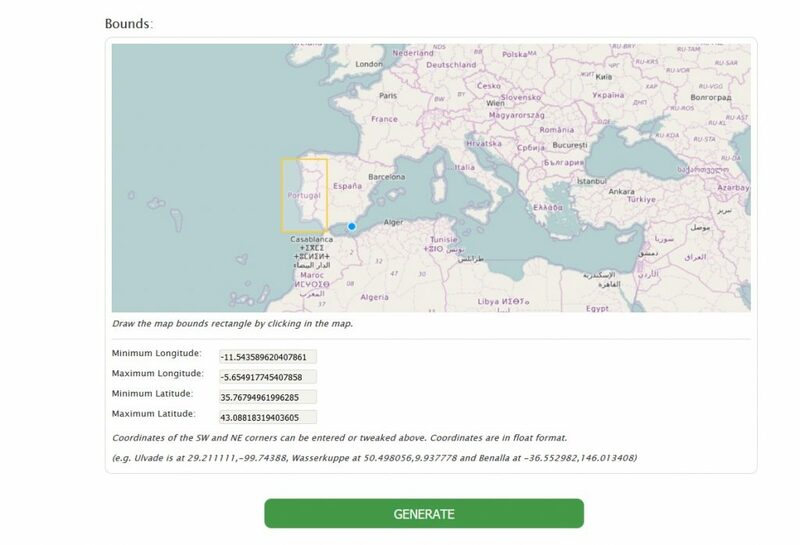 The airspace files are typically maintained by volunteers, and the website is organised by region and then country to help you locate what you need. Once you have clicked on an airspace file and it opens in your browser, you will need to save it to your computer as a .txt (text) so that when loaded to your Kobo it is recognised as an airspace file. Note that the UK is slightly different, and instead of a hand-crafted file, we have a browser-based web program called ASSELECT (https://asselect.uk/) which you use to generate an airspace file. This program has kindly been produced by Geoff Brown, who diligently processes each monthly AIP (a part automated, part manual process) to ensure we can produce up-to-date files. Rather than us having to monotonously generate a new airspace file every 28 days, it is better to check Geoff’s useful ‘Update History‘ (bottom right in screenshot) to see if there are any material changes that affect you – quite often there are no significant changes. 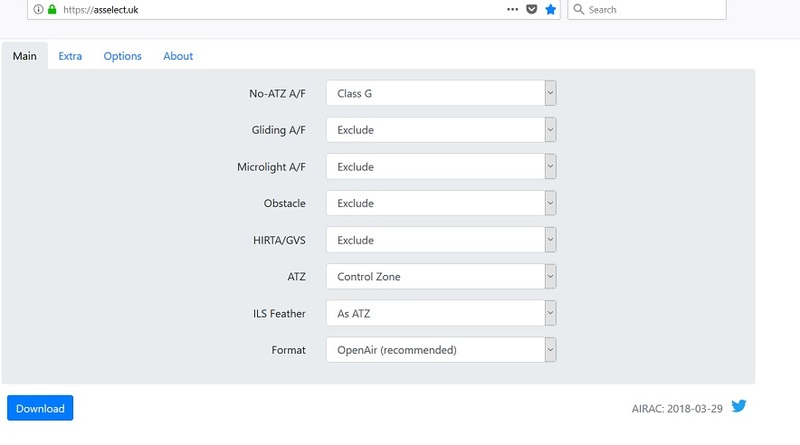 There are 4 tabs; the ‘MAIN‘ tab (as shown above) give you the opportunity to include/exclude/modify uncontrolled airspace to suit your needs (obviously all controlled airspace is included). The other 3 tabs give you a similar opportunity to include/exclude various features and concessions such as Wave boxes, LOA’s, etc. When you are ready, selected the Openair format, and pressing OK will generate your airspace file. You will probably only need this if (i) you live in a country with regular/temporary NOTAM changes, and (ii) you fly cross country hence will need to be aware of such temporary airspace. Here in the south UK I have found approx. one in five summertime XC days that have significant notams which warrant the creation of a daily NOTAM airspace file. 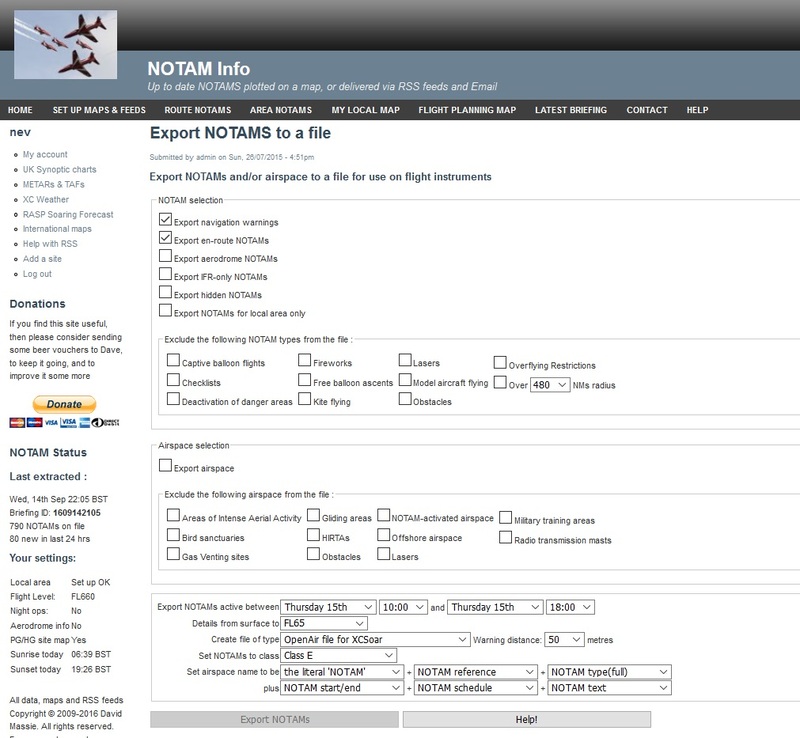 For some years now Dave Massie has maintained/developed the superb website notaminfo.com and many pilots will be familiar with the visual user interface (see example below). The website now covers 20 countries, mainly European ones. Step 1 – Download the latest version of XCSoar for the Kobo from the XCSoar Website (example screen below), and save it to your computer. 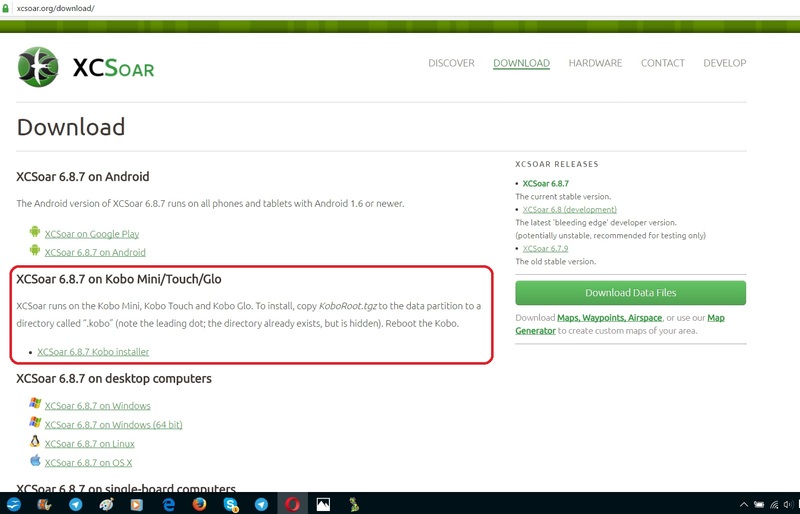 The download file will be called KoboRoot.Tgz. If you already have XCSoar you can use the use SYSTEM – EXPORT USB STORAGE method as described in section 2, Getting Maps, Waypoint and Airspace files onto your Kobo. If its a new Kobo (without XCSoar), you’ll need to connect via the native Kobo dialogue that prompts you to connect to your computer (not via Wifi) when you plug the USB cable in. Step 3 – Drag/drop the KoboRoot.Tgz file into the Kobo directory named .Kobo Important: Note the ‘dot’ prefix, as there is another directory named Kobo without a dot prefix! Step 4 – Disconnect the Kobo; if its a new Kobo you will need to EJECT the drive from the PC before unplugging the USB cable, or if you used SYSTEM – EXPORT USB STORAGE to connect then you can press OK to close the dialogue on the Kobo. After this, you should see the LED near the on/off switch flicker, and the software will then first install, then the unit will restart and show the XCSoar menu (it takes a few minutes). Sometimes it doesn’t happen automatically, in which case turn the unit off, leave for 10 seconds then turn on, after which the install/restart process will happen. During 2016 XCSoar introduced functionality to tailor XCSoar menus and add buttons that can be instructed to perform various functions (known as XCI files, or XCSoar Initialisation). The example that follows is a simple menu to allow Kobo/XCSoar unit to control a few simple aspects of a Bluefly GPS/Vario. 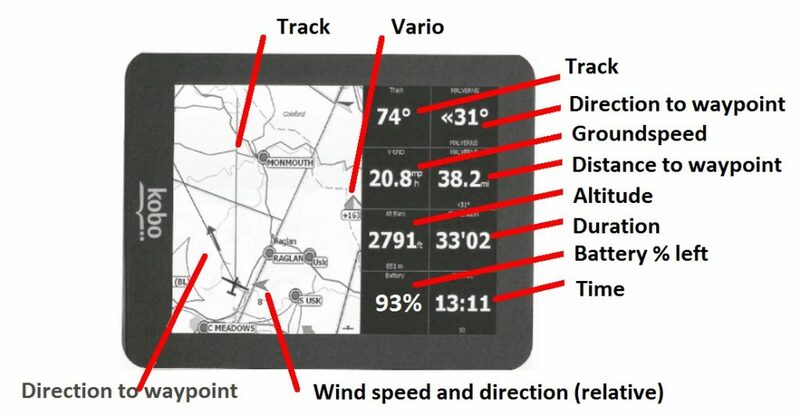 Context: Most users simply turn their Bluefly on and use the GPS and Altitude data that is streamed into the Kobo/XCSoar unit. However, the Bluefly hardware (which has its own autonomous processor) has around 30 different commands that can be used to change characteristics such as volume, audio up/down thresholds, the style of audio beep, etc. On pressing the M (menu) button on the XCsoar screen, the following menu is presented, and the button in the bottom left labelled BLUEFLY is a new Bluefly-related menu that the XCI file added. First, try pressing the TestBeep button, which will beep to confirm the connection to the Bluefly is all good: note that the Bluefly must be turned ON, and XCSoar must be in FLY (not SIM) mode. With all other options a press of the button will change the firmware without any visible/audible result. For example, pressing Sink1ms sets the audio/down threshold to 1ms (200fpm), and pressing Sink2ms sets the audio/down threshold to 2ms (400fpm). The only way to check this has taken effect is to fly in sink, or to clasp your instrument and run down the stairs fast (1ms is achievable, but 2ms would probably be a health & saftey risk). LXMode and BFMode will both change the output mode and output frequency. 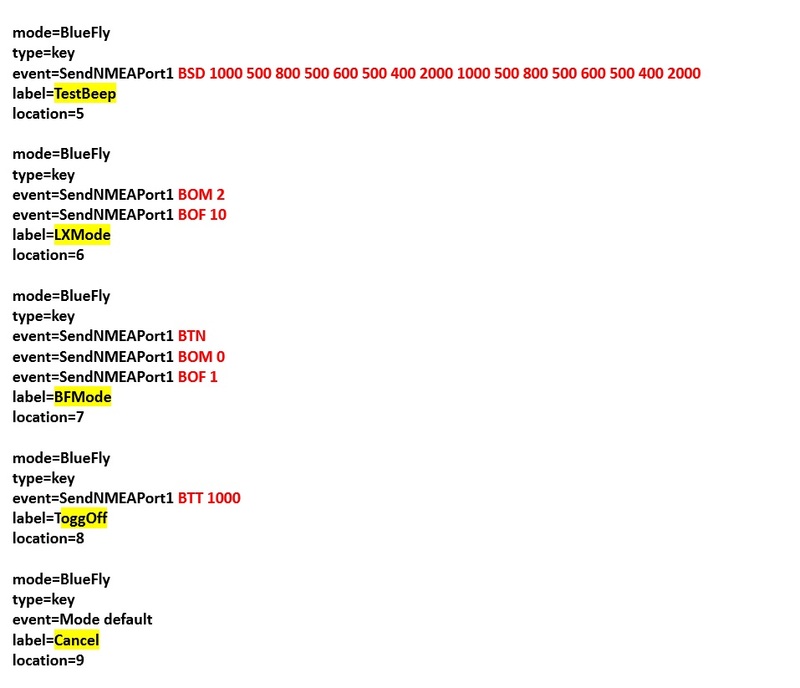 BFMode outputs data at 50Hz and will require the Bluefly driver to be used (chosen in device settings), and LXMode outputs data at 5Hz and will require the LX driver. Note that with the wrong driver selected, the GPS data still gets used, but the barometric data doesn’t. Some of the more recent and high resolution Kobo’s seem to perform better in LXMode, probably because the reduced data input allows the kobo to better cope with the overhead of managing a high definition screen. Toggoff will set a Bluefly parameter called Togglethreshold to 10. In summary, when you now use the Bluefly push button to mute the audio, the Bluefly won’t now “un-mute” automatically when then Bluefly detects movement (you will want it like this if the Bluefly isn’t your primary vario). Any of the 30 or so Bluefly settings can be changed (too much detail for this tutorial here). 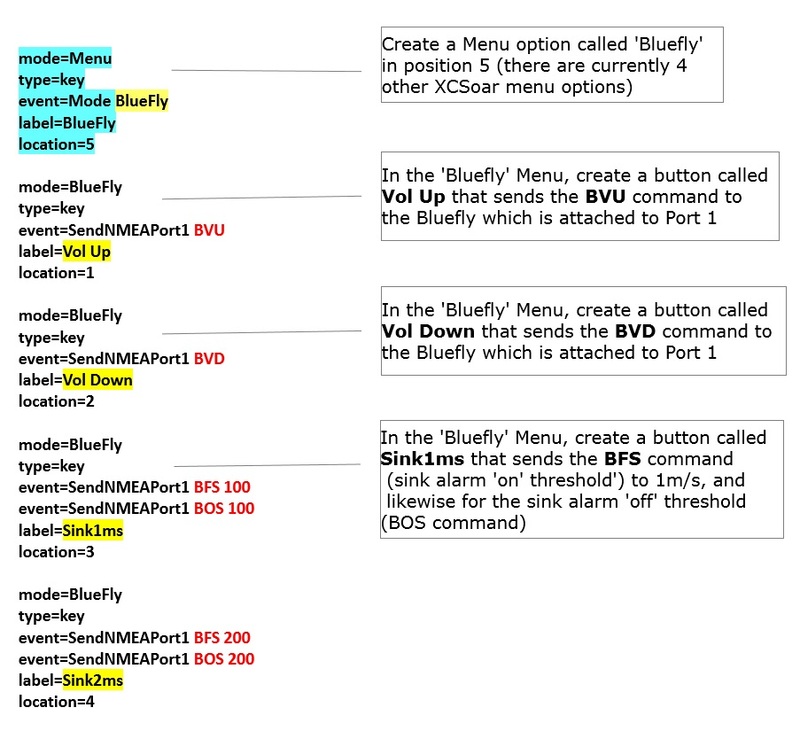 To get an idea of what can be changed, see the range of commands in the hardware settings manual at http://www.blueflyvario.com/support/. The data within the XCI file used in the example above looks like below. The first block of data (turqouise) creates the new menu option called Bluefly, and the subsequent blocks each define an option within the Bluefly menu, e.g. Vol Up, Vol Down, etc. The Bluefly commands are the 3 character strings in red.